Do you want to avoid the traffic but still enjoy the Golden circle, while doing it in an amazing way? Then this is the tour for you! We start the day by picking you up in Reykjavik and taking you out to Thingvellir national park, to meet up with the buggy guides. There you will be provided with all the necessary gear to make this an enjoyable tour; Helmets, Gloves, Balaclavas & Coveralls. After a short security briefing it is time to hit the road! 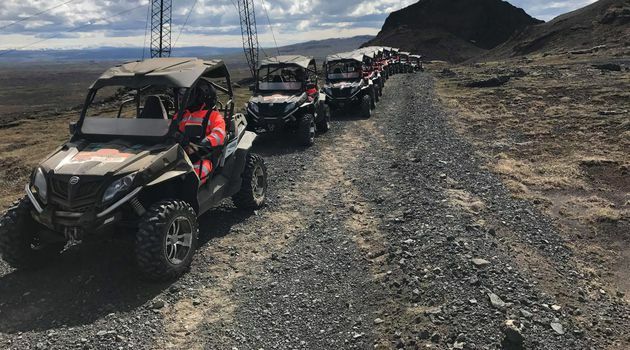 You will travel outback mud tracks headed to Geysir geothermal area, where you will stun the crowds as you arrive in style! At Geysir, you will see geyser Strokkur spout 100°C water high into the air, giving testament to the amazing energy our earth has under our feet. Next up it is back-roads towards Gullfoss waterfall - known mainly for it's beauty. To get there, you must travel along Haukadalsheiði moor and Kjölur highland road. Once you have done this sightseeing, it is time to head back a similar way, to Thingvellir again. After you have taken off the buggy gear, your guide will show you around Thingvellir national park, before heading back to Reykjavik. This tour might not be suitable for those with back problems or similar medical conditions. WEIGHT LIMIT: The buggies are strong for their size, but like all cars they have a maximum bearing weight. Maximum weight per passenger/driver; 120 kg or 264 lbs. Maximum combined weight; 220 kg or 485 lbs.